As with droughts, floods are a natural part of the life of a river; and as we saw with droughts, the severity of a flood can be amplified by human activities. Flooding can be reduced by capturing flood waters in big Army Corp reservoirs like Perry and Clinton. Flooding can also be made worse by increasing the amount of pavement and other impermeable surfaces in a watershed, by reducing vegetation, and other activities that increase run-off and speed rain water to streams and rivers. People usually view floods as disasters, but floods can benefit the ecology of the river by washing in food organisms like terrestrial insects, moving back trees that may be constraining the channel, they may reshape the channel and move sand and gravel downstream to form sand bars, and floods can open up spawning areas and trigger reproduction in fish. So what is a disaster to us land dwellers can be a boon to the water dwellers. The 1951 flood was so severe that it destroyed large parts of Topeka and other riverside communities along the Kaw. The hydrograph in this slide is from the 1993 flood, which was not as high at its peak (see below), but was more widespread and longer lasting. When a river floods the water spreads over the top of its banks and out into the flood plain. This allows fish to move out into shallow, slow water and swim through trees, bushes, and grass to hunt for bugs. If the timing is right, they may even find nesting sites and nurseries out on the flood plain--after a flood we often see populations of many species increasing. 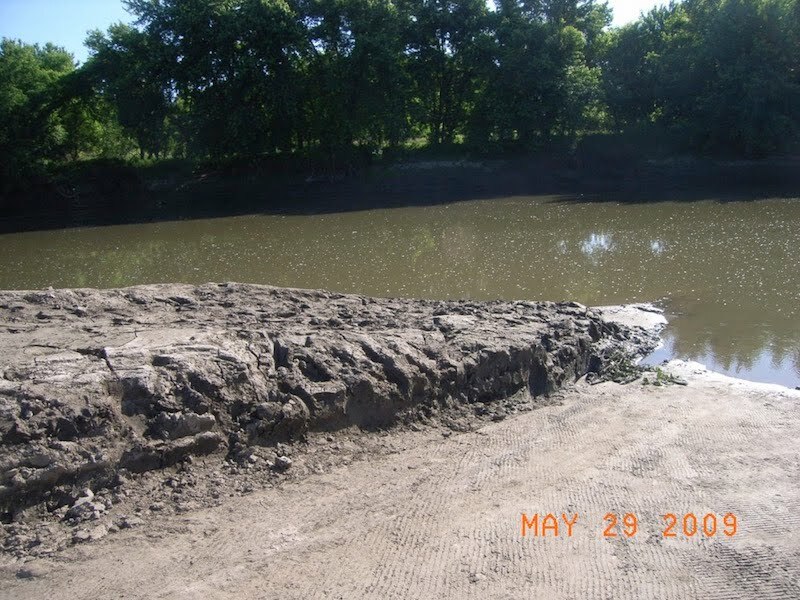 But when a river bed is degraded, as it is on the lower Kaw, the banks become deeply incised, preventing fish from moving out of the banks at high water. Instead what may happen during a flood is that the water becomes deeper and faster, rather than wider and slower. This means that fish can't reach slow water refuges during floods, resulting in stress and population declines. When banks are vegetated with a healthy riparian forest, and when the river bed isn't degraded, floods may actually increase the amount of land along the banks, rather than eroding it. This happens because the water slows down as it flows over the bank and through trees and bushes, depositing the soil particles that it carries with it. This increased deposition of sediment in river reaches with riparian forests can be seen in the graph above. Notice that when there are no trees and bushes, only agricultural crops, the bank is eroded. Topeka responded to the 1951 flood with the construction of flood control channels, reservoirs, and levees. 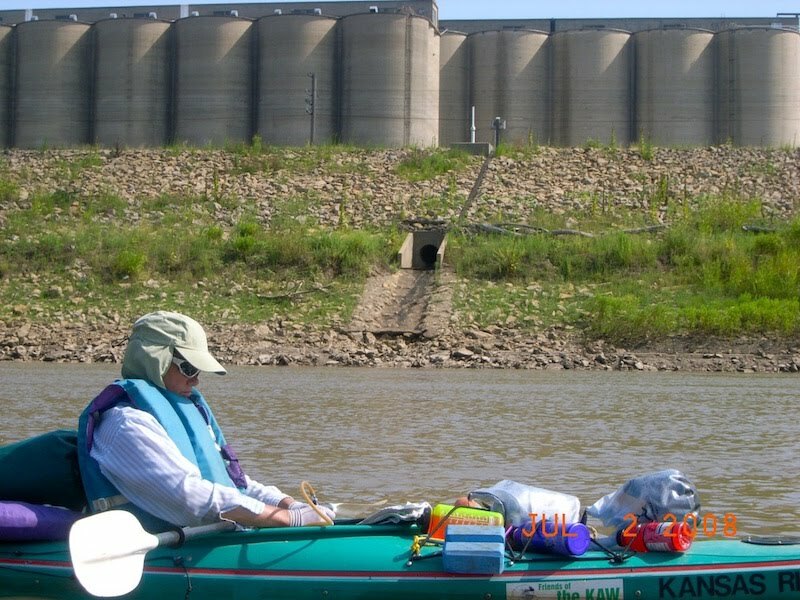 The stretch of the Kaw which flows through Topeka has steep banks, little riparian vegetation, and little good habitat for native fish and other aquatic organisms. Soldier Creek was turned into a flood control channel with little resemblance to a natural stream. There are now plans to restore at least a little of its ecological functioning with new projects aimed at adding meanders and other habitat features to the canal, which will certainly make it more attractive to aquatic organisms. 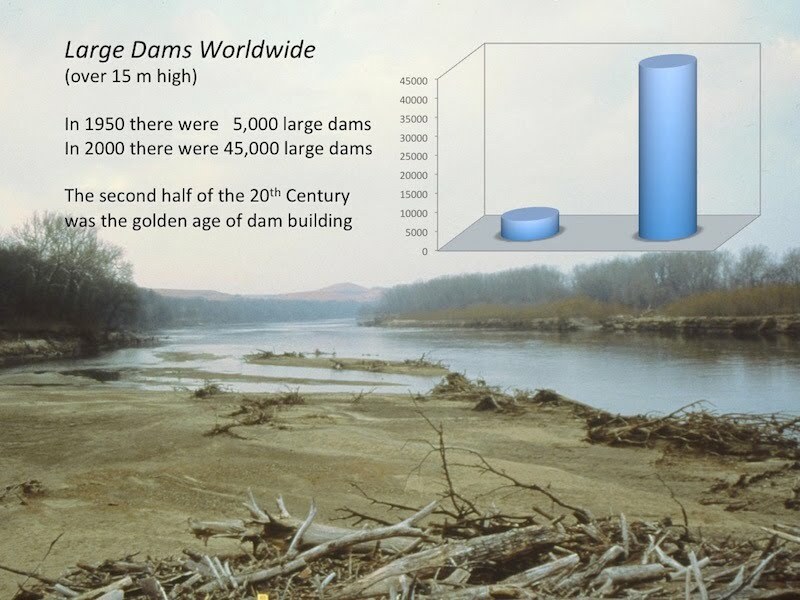 800,000 dams of all sizes now block the flow of rivers worldwide, trapping one-fourth of the sediment carried by rivers and depositing it in reservoirs. Source: Postel and Richter (2003) Rivers for Life. Island Press. Pages 13-17. 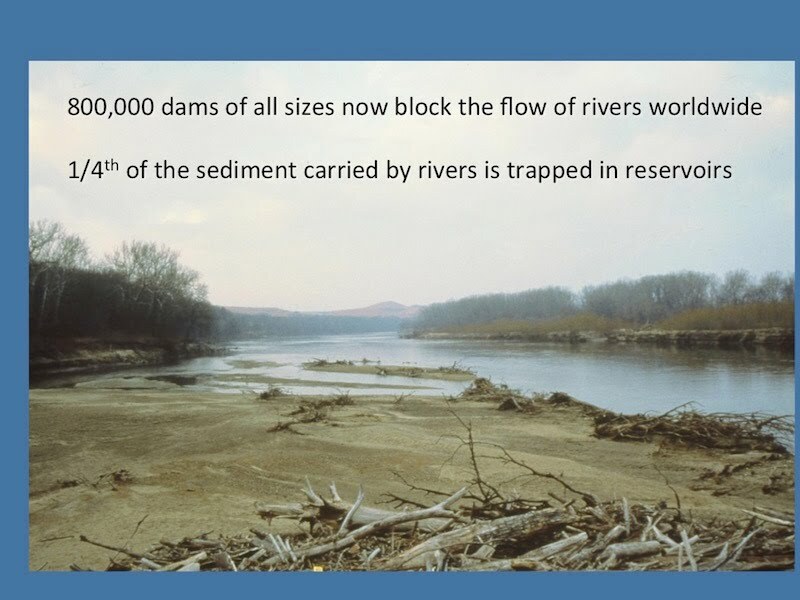 One of the unintended consequences of building dams in places like Kansas, where the soil is highly erodible, is that the sediment carried by rivers is trapped in the reservoirs. Perry Lake, on the Delaware River, has already been filled in so much that less than two-thirds of its capacity is left to trap flood waters. The sediment deposited by the Delaware River above Perry Lake is so thick that it must be bull dozed off the boat ramp. 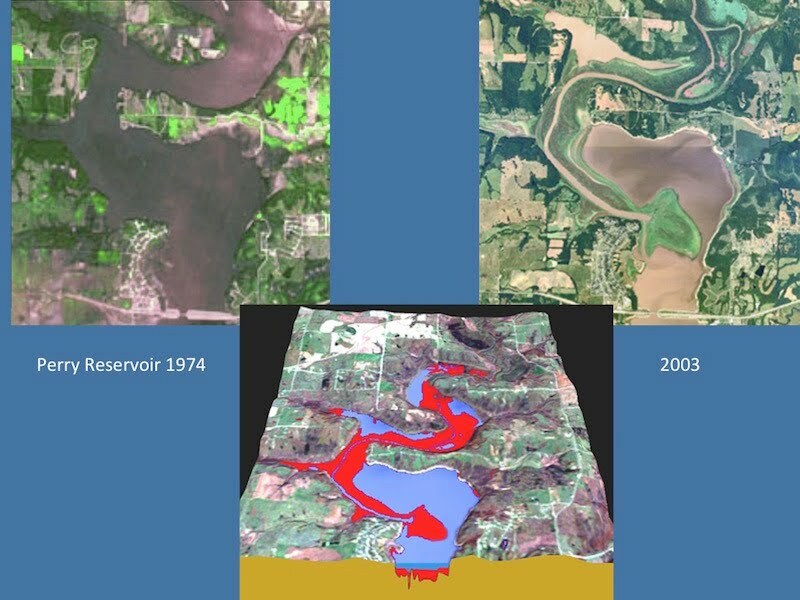 Another unintended consequence of all these dams is that the Mississippi River no longer gets much sediment from its tributaries, and as a result is no longer able to carry a heavy sediment load to Louisiana. As a result of the reduction in sediment load, the Mississippi River Delta is shrinking, exposing coastal areas to storm surges from the Gulf and reducing their protection from hurricanes. All of that dirt piled up in the upper Delaware might be more welcome in the Mississippi Delta.